Shortly after the construction fence was removed, the freesport field was filled with kids lining up to play pick-up soccer. On Wednesday, Oct 30, King County Parks was delighted to attend the City of Auburn’s ribbon cutting celebration of Lea Hill Park, a 7-acre park near Green River Community College. 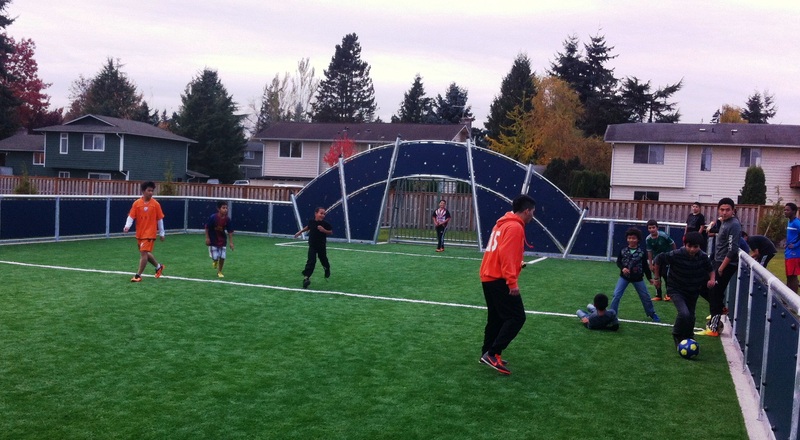 The King County Youth Sports Facilities Grant program (YSFG) provided a $60,000 matching grant to Auburn for the construction of the “freesport” field, a small walled synthetic turf area ideal for 3-on-3 or 4-on-4 games of soccer. The field can also be adapted for sports like basketball, volleyball, football, field hockey, badminton, pickleball, and no doubt countless other games the local kids will come up with in order to chase each other around the field! The land for the park was acquired as part of a land exchange with Green River Community College, which will build a trades center on the site of a former Auburn city park. The new park also offers a skate spot, walking pathways, a wooden picnic shelter reminiscent of a barn, an amphitheater, a baseball field, half basketball court and a play area with a tractor and climbing toys. Congrats to the City of Auburn on their lovely new park! Previous Post Boo! Creeeeeeaaak. Scream! Cackle.